Suchomimus (meaning "crocodile mimic") is a genus of spinosaurid theropod dinosaur that lived between 125 to 112 million years ago in what is now Niger, during the Aptian to early Albian stages of the Early Cretaceous Period. The animal was named and described by Paul Sereno and colleagues, based on a partial skeleton from the Erlhaz Formation. Its long and shallow skull, similar to that of a crocodile, earns it its genus name, while the species Suchomimus tenerensis alludes to the locality of its first remains, the Ténéré Desert. Some palaeontologists consider the animal to be an African species of the European spinosaurid Baryonyx, B. tenerensis. Suchomimus might also be a junior synonym of the contemporaneous spinosaurid Cristatusaurus lapparenti, although the latter taxon is based on much more fragmentary remains. 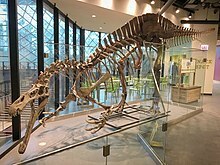 Suchomimus was 9.5 to 11 metres (31 to 36 ft) long and weighed between 2.5 to 5.2 tonnes (2.8 to 5.7 short tons), although the holotype specimen may not have been fully grown. Suchomimus's narrow skull was perched on a short neck, and its forelimbs were powerfully built, bearing a giant claw on each thumb. Along the midline of the animal's back ran a low dorsal sail, built from the long neural spines of its vertebrae. Like other spinosaurids, it likely had a diet of fish and small prey animals. The length of the type specimen of Suchomimus, a subadult, was initially estimated at 10.3–11 metres (34–36 ft), with an estimated weight of between 2.7–5.2 tonnes (3.0–5.7 short tons). Gregory S. Paul, however, gave lower estimations of 9.5 metres (31 ft) and 2.5 tonnes (2.8 short tons). Unlike most giant theropod dinosaurs, Suchomimus had a very long, low snout and narrow jaws, formed by a forward expansion of the praemaxillae (frontmost snout bones) and the anterior ramus (branch) of the maxilla (main upper jaw bone). The praemaxillae had an upward branch excluding the maxilla from the external nares (bony nostrils). The jaws had about 122 conical teeth, pointed but not very sharp and curving slightly backwards, with fine serrations. The tip of the snout was enlarged sideways and carried a "terminal rosette" of longer teeth, seven per side in the skull and about the same number in the corresponding part of the lower jaw. Further back, there were at least 22 teeth per upper jaw side in the maxilla, while the entire lower jaw side carried 32 teeth in the dentary bone. The upper jaw had a prominent kink just behind the rosette, protruding downwards; this convexly curved part of the maxilla had the longest teeth of the entire skull. The skull is reminiscent of that of crocodilians that eat mainly fish. The internal bone shelves of the maxillae met each other over a long distance, forming a closed secondary palate that stiffened the snout. The external nares were long, narrow and horizontally positioned; the same was true of the larger antorbital fenestrae, a pair of bony openings in front of the eyes. The rear of the skull is poorly known but for a short quadrate bone, separated from the quadratojugal bone by a large foramen quadraticum, shows it must have been low. The lower jaws were greatly elongated and narrow, forming a rigid structure as their dentaries touched each other at the midline, reinforcing the mandible against torsional (bending and twisting) forces. The describers established some autapomorphies (unique derived traits) of Suchomimus. The upwards projecting neural spines of the rear dorsal (back), sacral (hip) and front caudal (tail) vertebrae were expanded in side view. The upper corners of the humerus (upper arm bone) were robust. The humerus had a boss (bone overgrowth) above the condyle that contacted its hook-shaped radius (forearm bone). The neck was relatively short but well-muscled as shown by strong epipophyses. There were about sixteen dorsal vertebrae. Suchomimus had unusually extended neural spines, blade-shaped upward extensions on the vertebrae, which are elongated at the rear back. Those of the five sacral vertebrae were the longest. The elongation of these structures continued until the middle tail. The spines may have held up some kind of low crest or sail of skin that was highest over its hips, lower and extending further to the back than that of Spinosaurus. The furcula (wishbone) is V-shaped and indicates a high and narrow trunk. The humerus was very strongly built, only equalled in size among theropoda by that of Megalosaurus and Torvosaurus. Accordingly, the ulna of the lower arm was well-developed with an enormous olecranon (upper process set-off from the shaft), an exceptional trait shared with Baryonyx. The heavy arm musculature powered sizable hand claws, that of the first digit (or "thumb") being the largest with a length of 19 cm (7.5 in). In the pelvis, the ilium (main hip bone) is high. The pubis (pubic bone) has a front surface that is wider than the side surface. The femur (thighbone) is straight and robust, with a length of 107 cm (42 in) in the holotype. Its lesser trochanter is markedly plate-like. In 1997, palaeontologist Paul Sereno and his team at Gadoufaoua discovered fossils that represented about two-thirds of the skeletal elements of a large carnivorous theropod in Niger. The first find, a giant thumb claw, was made on 4 December 1997 by David Varricchio. On 11 November 1998, Paul Sereno, Allison Beck, Didier Dutheil, Boubacar Gado, Hans Larsson, Gabrielle Lyon, Jonathan Marcot, Oliver Walter Mischa Rauhut, Rudyard Sadleir, Christian Sidor, David Varricchio, Gregory Wilson and Jeffrey Wilson named and described the type species Suchomimus tenerensis. The generic name Suchomimus ("crocodile mimic") is derived from the Greek σοῦχος, souchos, the Greek name for the Egyptian crocodile god Sobek, and μῖμος, mimos, "mimic", after the shape of the animal's head. The specific name tenerensis is after the Ténéré Desert where the animal was found. The holotype, MNN GDF500, was found in the Tegama Beds of the Elrhaz Formation dating from the Aptian. It consists of a partial skeleton lacking the skull. It contains three neck ribs, parts of fourteen back vertebrae, ten dorsal ribs, belly ribs, pieces of three sacral vertebrae, parts of twelve tail vertebrae, chevron bones, a shoulder blade, a coracoid, a forelimb, a pelvis side, and parts of a hindlimb. The vertebral column was largely articulated, the remainder consisted of disarticulated bones. Parts of the skeleton had been exposed on the desert surface and had suffered erosion damage. Additionally, several specimens have been assigned as paratypes: MNHN GDF 501, a snout; MNHN GDF 502, a quadrate; MNHN GDF 503, a dentary; MNHN GDF 504, a dentary; MNHN GDF 505, a dentary; MNHN GDF 506: an axis; MNHN GDF 507, a rear neck vertebra; MNHN GDF 508, a rear back vertebra; MNHN GDF 510, a tail vertebra; and MNHN GDF 511, another tail vertebra. The fossils are part of the collection of the Musée National du Niger. The initial description of Suchomimus was preliminary. In 2007, the furcula, found during a subsequent expedition in 2000, was described in detail. Suchomimus was placed in the Spinosauridae, a group of large predators with jaws adapted for hunting fish and with flatter skulls when compared to other similarly-sized theropods, like the Tyrannosauridae. Their teeth were adapted for grasping rather than slicing and the roof of the mouth was more solid, allowing the spinosaurids to resist twisting forces exerted by prey. The rest of the body was not particularly adapted to the water. Within the Spinosauridae, Suchomimus was a member of the subfamily Baryonychinae. Apart from its possibly higher back crest, Suchomimus was very similar to the spinosaurid Baryonyx from the Barremian of England which also had strong forelimbs and a huge sickle-curved claw on its "thumb". And, as with Suchomimus, the claw of Baryonyx had been the first fossil part to be found in the field. The holotype of Suchomimus was considerably larger than that of Baryonyx, but the ages of the two individuals are not known. In 2002, the German palaeontologist Hans-Dieter Sues and colleagues concluded that Suchomimus was identical to Cristatusaurus lapparenti found in the same formation of Niger and, despite Cristatusaurus having been named somewhat earlier than Suchomimus, proposed them to represent a second species of Baryonyx called Baryonyx tenerensis. Sereno and colleagues in 1998 analyzed the distribution of forty-five traits to produce a cladogram that showed Suchomimus and Baryonyx to be distinct but closely related. The following phylogenetic tree shows a 2009 analysis of the Megalosauroidea. The Elrhaz Formation, part of the Tegama Group, consists mainly of fluvial sandstones with low relief, much of which is obscured by sand dunes. The sediments are coarse- to medium-grained, with almost no fine-grained horizons. Suchomimus lived in what is now Niger, during the late Aptian to early Albian stages of the Early Cretaceous, 112 million years ago. The sediment layers of the formation have been interpreted as an inland habitat of extensive freshwater floodplains and fast-moving rivers, with a tropical climate that likely experienced seasonal dry periods. This environment was home to a variety of fauna including dinosaurs, pterosaurs, chelonians, fish, hybodont sharks, and freshwater bivalves. Suchomimus coexisted with other theropods like the abelisaurid Kryptops palaios, the carcharodontosaurid Eocarcharia dinops, and an unknown noasaurid. Herbivorous dinosaurs of the region included iguanodontians like Ouranosaurus nigeriensis, Elrhazosaurus nigeriensis, Lurdusaurus arenatus, and two sauropods: Nigersaurus taqueti, and an unnamed titanosaur. Crocodylomorphs were abundant; represented by the giant pholidosaur species Sarcosuchus imperator, as well as small notosuchians like Anatosuchus minor, Araripesuchus wegeneri, and Stolokrosuchus lapparenti. The local flora probably consisted mainly of ferns, horsetails, and angiosperms, based on the dietary adaptations of the large diplodocoids that lived there. Suchomimus appears in Jurassic World: The Game as a legendary carnivore. Suchomimus appears in The Isle as a strong mid-tier carnivore. ^ Therrien, François; Henderson, Donald M. (2007). "My theropod is bigger than yours … or not: estimating body size from skull length in theropods". Journal of Vertebrate Paleontology. 27 (1): 108–115. doi:10.1671/0272-4634(2007)27[108:MTIBTY]2.0.CO;2. ^ a b c d e f g h i Sereno, P.C. ; Beck, A.L. ; Dutheil, D.B. ; Gado, B.; Larsson, H.C.E. ; Lyon, G.H. ; Marcot, J.D. ; Rauhut, O.W.M. ; Sadleir, R.W. ; Sidor, C.A. ; Varricchio, D.D. ; Wilson, G.P; Wilson, J.A. (1998). "A long-snouted predatory dinosaur from Africa and the evolution of spinosaurids". Science. 282 (5392): 1298–1302. Bibcode:1998Sci...282.1298S. doi:10.1126/science.282.5392.1298. PMID 9812890. ^ a b Lipkin, Christine; Paul; Sereno, Callistus; Horner, Jack (2007). "The furcula in Suchomimus tenerensis and Tyrannosaurus rex (Dinosauria: Theropoda: Tetanurae)". Journal of Paleontology. 81 (6): 1523–1527. doi:10.1666/06-024.1. ^ Holtz, T.R., Jr (1998). "Spinosaurs as crocodile mimics". Science. 282 (5392): 1276–1277. doi:10.1126/science.282.5392.1276. ^ Charig, A. J.; Milner, A. C. (1997). "Baryonyx walkeri, a fish-eating dinosaur from the Wealden of Surrey". Bulletin of the Natural History Museum of London. 53: 11–70. ^ Sues, H.-D.; Frey, E.; Martill, M.; Scott, D.M. (2002). "Irritator challengeri, a spinosaurid (Dinosauria: Theropoda) from the Lower Cretaceous of Brazil". Journal of Vertebrate Paleontology. 22 (3): 535–547. doi:10.1671/0272-4634(2002)022[0535:icasdt]2.0.co;2. ^ Benson, R. B. J.; Carrano, M. T.; Brusatte, S. L. (2009). "A new clade of archaic large-bodied predatory dinosaurs (Theropoda: Allosauroidea) that survived to the latest Mesozoic". Naturwissenschaften. 97 (1): 71–78. Bibcode:2010NW.....97...71B. doi:10.1007/s00114-009-0614-x. PMID 19826771. ^ Sereno, P. C.; Beck, A. L.; Dutheil, D. B.; Larsson, H. C.; Lyon, G. H.; Moussa, B.; Sadleir, R. W.; Sidor, C. A.; Varricchio, D. J.; Wilson, G. P.; Wilson, J. A. (1999). "Cretaceous sauropods from the Sahara and the uneven rate of skeletal evolution among dinosaurs". Science. 286 (5443): 1342–1347. doi:10.1126/science.286.5443.1342. PMID 10558986. ^ a b c Sereno, P. C.; Brusatte, S. L. (2008). "Basal abelisaurid and carcharodontosaurid theropods from the Lower Cretaceous Elrhaz Formation of Niger". Acta Palaeontologica Polonica. 53 (1): 15–46. doi:10.4202/app.2008.0102. ^ Sereno, P. C.; Wilson, J. A.; Witmer, L. M.; Whitlock, J. A.; Maga, A.; Ide, O.; Rowe, T. A. (2007). "Structural extremes in a Cretaceous dinosaur". PLoS ONE. 2 (11): e1230. Bibcode:2007PLoSO...2.1230S. doi:10.1371/journal.pone.0001230. PMC 2077925. PMID 18030355. ^ a b c Sereno, P. C.; Wilson, J. A.; Witmer, L. M.; Whitlock, J. A.; Maga, A.; Ide, O.; Rowe, T. A. (2007). "Structural extremes in a Cretaceous dinosaur". PLoS ONE. 2 (11): e1230. Bibcode:2007PLoSO...2.1230S. doi:10.1371/journal.pone.0001230. PMC 2077925. PMID 18030355. .
^ a b Sereno, Paul C.; Larson, Hans C. E.; Sidor, Christian A.; Gado, Boubé (2001). "The Giant Crocodyliform Sarcosuchus from the Cretaceous of Africa". Science. 294 (5546): 1516–1519. Bibcode:2001Sci...294.1516S. doi:10.1126/science.1066521. PMID 11679634. Paul Sereno - Project Exploration Suchomimus Fact Sheet, at Project Exploration. Photos of Suchomimus Skeleton in Niger, at Project Exploration.